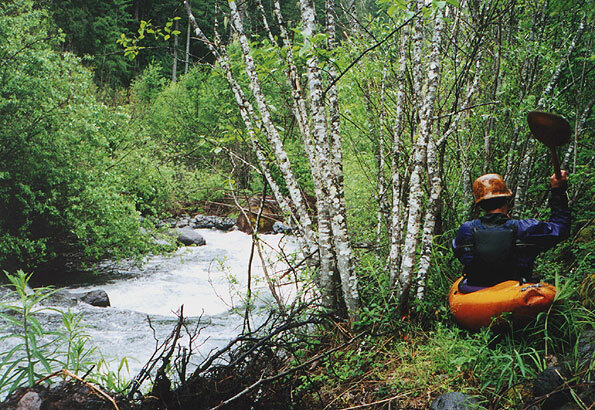 Copyright © 2000, Oregon Kayaking. No part of this page may be reproduced, linked, or copied without the express written permission of the Oregon Kayaking Webmaster. First of all, I feel obligated to say that this run is very dangerous and marginally runnable due to the wood. Just because we ran some of the log-choked drops pictured here doesn't mean this run was worth doing- in fact, I don't recommend it at all! Swift Creek is an ornery little stream in the North Umpqua drainage that seems to be in a serious hurry to get down the mountainside. With a gradient in the 200 fpm range in the upper section this run can be a little hair raising at times. Mix that kind of gradient with a very narrow creekbed and a fair amount of wood and you've got a real handful. Unfortunately the rapids are kind of bland (uniformly difficult small boulder gardens with wood) so I don't really recommend this creek. That said, if you enjoy dodging logs on steep, tight creeks and just can't wait to repeat the experience, this run is for you. First of all, stay off of the creek at high water. If you get to the take out bridge and all of the rocks are covered go elsewhere. 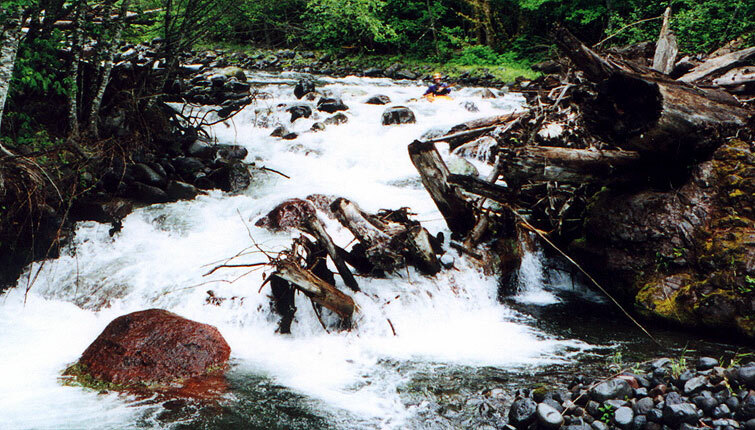 The logs that are hard to avoid at lower flows would become deathtraps at high water. What the hell am I talking about? This run is a deathtrap at ANY flow!! Dan Coyle and I explored this creek in the spring of 2000. We were intrigued by the gradient and the semi-remote nature of the run. We drove up from the bridge about three miles and put in and were off in a rush. Eddies were few and we found ourselves dodging wood and screeching into tiny eddies above a log jam or two. Dan portaging a log on Swift Creek. 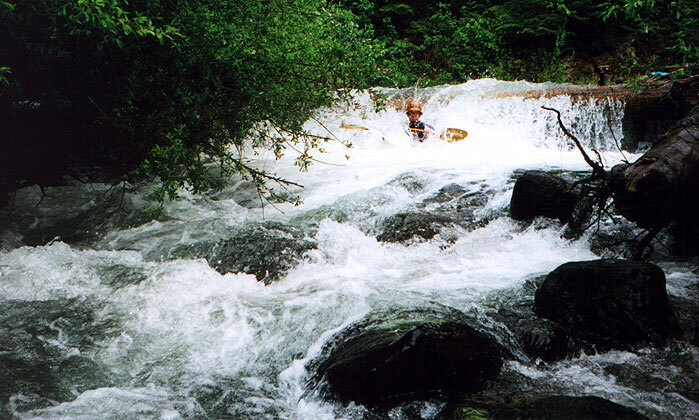 The upper mile and a half is quite steep but none of the rapids really stand out- there are many small, bouldery drops that are fun but not memorable. It seemed to me that every time the creek started to get fun there was more wood to deal with. We portaged a log or two and dodged a whole bunch more! Dan runs an ugly log choker on Swift Creek. Access and Flows: Are you kidding? You'd have to be smoking some serious crack to want to repeat this one, but if you insist, send me an email and I'll try and talk you out of it. If you persist, I'll give you directions, and wish you luck!